Ruth Jones in The Nightingales. Images Geraint Lewis. 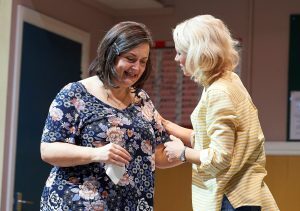 Actor and writer William Gaminara plumbs Ayckbourn territory for The Nightingales, an odd bird which has just opened at Theatre Royal Bath with TV actress Ruth Jones tempted back to the stage. This could have been a subversive black comedy about the bigotry and small mindedness of middle class, mostly white, rural communities living in Middle England – and it hints at it – but it never quite makes it. In the end it’s difficult to pigeonhole the production, if indeed it should bear any sort of label. It’s a pleasant enough drama but I walked away from Christopher Luscombe’s production feeling let down that it didn’t have more to say. Jones plays Maggie, a seemingly affable new arrival who has moved to the village with her young son and mother. She’s clearly lonely, knows no-one, and is keen to make friends. She is drawn to the a cappella singing coming from the village hall where a group of locals meet each week to run through everything from Motown to Mozart under the expert eye of choirmaster and former teacher Steven. Eventually she plucks up the courage to go in and, through sheer force of her cheerful personality, attaches herself to them, listening, doing chores, acting as a sounding board, even joining in the odd song. She appears a lovely, outgoing, bubbly Welshwoman with not a bad word to say about anyone. But is she as wonderful as she seems? Or is there a hidden agenda? She ‘accidentally’ lets slip that she has breast cancer and doesn’t know how she will manage and, of course, everyone in the group rallies around. The singing group – which bursts into song every now and then (and very good they are too) – also have their own issues. They may seem superficially bland, everything you’d expect to find in, oh I don’t know, Surrey stockbroker belt? Upmarket Hampshire perhaps? But each are far more complex and darker than first appearances suggest. Older Steven is frustrated at not being able to run his own professional choir while his younger, second, wife, Diane, desperately wants a baby even though he’s against the idea. Meanwhile former glamour model and bit-part actress, Connie (she once shared a scene with 007 Pierce Brosnan), and tennis player Ben, injured out of the game, bicker endlessly because life hasn’t turned out the way either had planned. 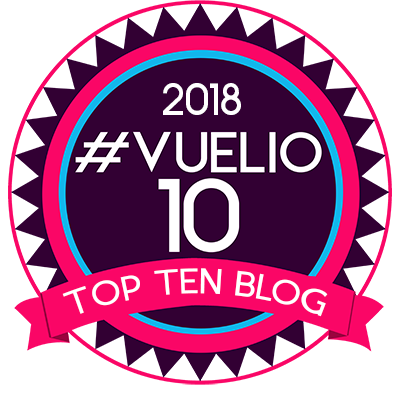 As for Bruno, a teacher who enjoys jogging and lives with his sick old mum, he tells an interesting story about how villagers called out the police helicopter when they saw a black man running through the area because they thought he was up to no good. Throughout the play each character sits down, facing the audience, to answer awful, inane, questions from an unseen, young female local reporter, who has been asked by Maggie to do a story on them. But, as someone who has been a young female local reporter, I was shocked by the banality of her questioning. She wouldn’t last a day asking stupid questions about favourite colours and numbers. Gaminara doesn’t seem entirely sure where he’s taking the plot. It starts off with Bruno encouraging the group to audition for Britain’s Got Talent and each of them soon have stars in their eyes. But that is done and dusted by the interval. There’s a second theme of Steven’s suspicions – firstly about Maggie and secondly about his wife’s adultery. Connie’s bitterness at not being the trophy wife of a top sportsman takes a brief turn in the spotlight while her husband, Ben’s character, is very underwritten. The whole thing ambles along…until it doesn’t. There is one moment when Ruth Jones shocks the entire Theatre Royal Bath audience with a nasty, vitriolic outburst, and then it’s over and the cast take their curtain call. 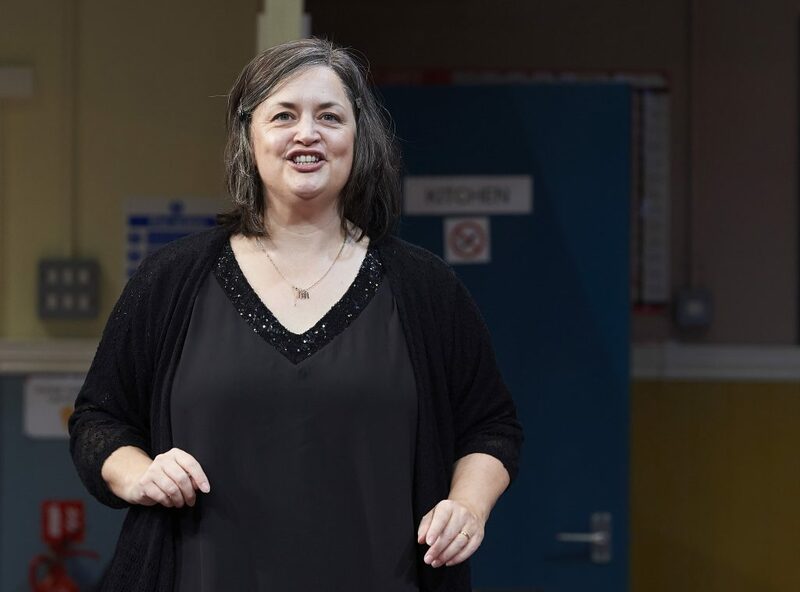 Ruth Jones looks at home on the stage although playing a gregarious Welshwoman is hardly a push. 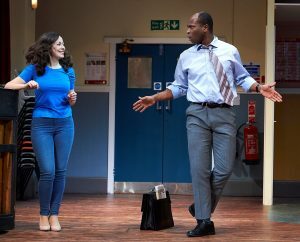 Steven Pacey, gives a nuanced turn as the cuckolded husband, Steven, while the rest of the cast – Sarah Earnshaw, Philip McGinley, Mary Stockley and Stefan Adegbola – give accomplished performances. As I said, all very pleasant and nice, but The Nightingales would struggle to fulfil ambitions of a West End slot. The Nightingales runs at Theatre Royal Bath until tomorrow then touring to Arts Theatre Cambridge (Nov 12-17); New Theatre Cardiff (Nov 19-24); Chichester Festival Theatre (Nov 27-Dec 1) and Malvern Theatres (Dec 3-8). It is hoped to transfer to a London theatre, yet to be announced, after touring. TV actress & writer Ruth Jones returns to the stage to play Maggie, an enigmatic new arrival who disrupts the lives of a rural amateur singing group.